Have you ever wanted to give Google Analytics a try to increase the efficiency of your ad campaigns or even start to create them for yourself to begin with? The free Analytics Startup Checklist is the best tool to help you get started. This template takes all the complicated matters out of the equation and leaves you with a simple checklist to complete at your own pace. 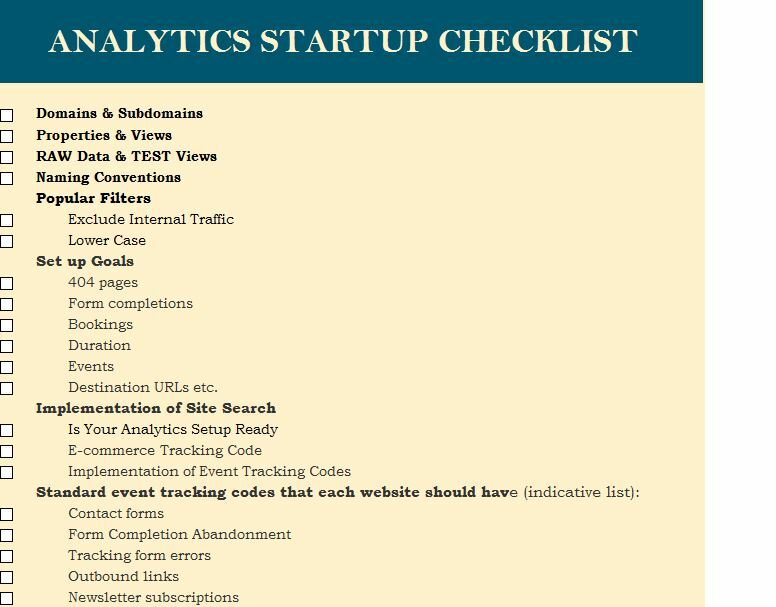 The Analytics Startup Checklist was designed and created by experts to ensure you meet all the requirements to get started with Google Analytics and makes sure you use it properly. To try it out, just continue reading the guide below. The free template document is available by simply following the link at the bottom of this page and opening the file once the download is complete. To get started, start by looking at the list of items that are given. The ultimate idea is to go through this list and make sure you have completed each task that has been given to you. You can also change any of the items that appear on this list by clicking the cell you want to change and adding something all your own. It really is that simple. The next step will be to actually go through these items to improve the efficiency of your own content. By using Google’s platform and cross-referencing the data they give you with this Analytics Startup Checklist, you will be able to improve engagement in a truly meaningful way. You will start at the top of the list and make your way through the items. For example, let’s say you come across a decrease in social media activity, this checklist provides a space in which to add social buttons to your site, making it easier for people to interact with your site and all its affiliates. You can later check and see how this impacted your engagement. You can see how quickly small items like these can really change the way you think about engagement for your site and it can help point you in the right direction.